How cozy and welcoming is this ‘lil porch. Very often, design inspiration photos tend to be huge spaces that aren’t realistic for the typical person. 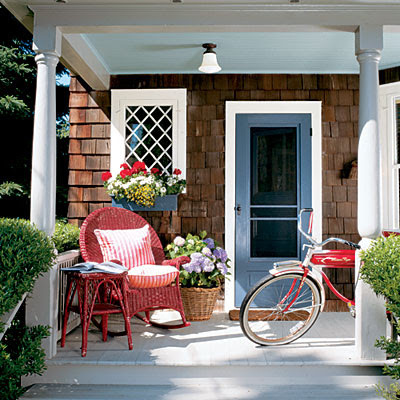 This quaint cottage proves a well styled petite abode may be all you need. This entry was posted in Uncategorized and tagged Bold, Color, design, door, inspiration, interior design, nautical, Pin of the Week, Porch, Southern. Bookmark the permalink. I always no a photograph or painting is good when I wish I could get inside the frame. This photo makes me feel this way… I’d like to sit on that porch and watch the world go by.